Help keep work crews comfortable and productive in hot, humid weather with NS® Kool Downs bandanas. This bandana covers worker's head and neck from hot, damaging sun rays and provides long-lasting, cooling relief. Just soak the bandana in cold water for 10-15 minutes to activate the innovative crystals and achieve cooling comfort for 24-72 hours. Bandanas can be refrigerated for even longer cooling. 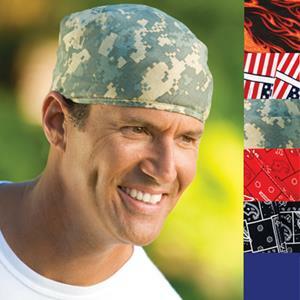 The NS® Kool Downs Bandana is made from 100% cotton and can be worn by itself or beneath bump caps and hard hats, making it ideal for construction workers, manufacturers, welders, fire fighters, and other employees who labor in high temperatures. Available in popular patterns workers can choose a bandana they’ll like wearing. Offer heat stress relief products that keep employees comfortable and maintain productivity. Help workers beat the heat by providing NS® Kool Downs bandanas.